It's been a pretty big week for director Kevin Smith, who revealed in a radio interview that he's turning his movie sequel idea for Mallrats 2 into a 10-episode TV series, while also teasing that he has found a home for his Buckaroo Banzai TV show as well. The director won plenty of praise for directing an episode of The CW's The Flash in April, which opened up a lot of new doors for the filmmaker. While his slate appears to be busier than ever, it seems the filmmaker wants to delve even deeper into Marvel's TV side by directing episodes of Daredevil and The Defenders. While Netflix hasn't officially renewed Daredevil for Season 3 quite yet, most fans are expecting the superhero series to return at some point next year. 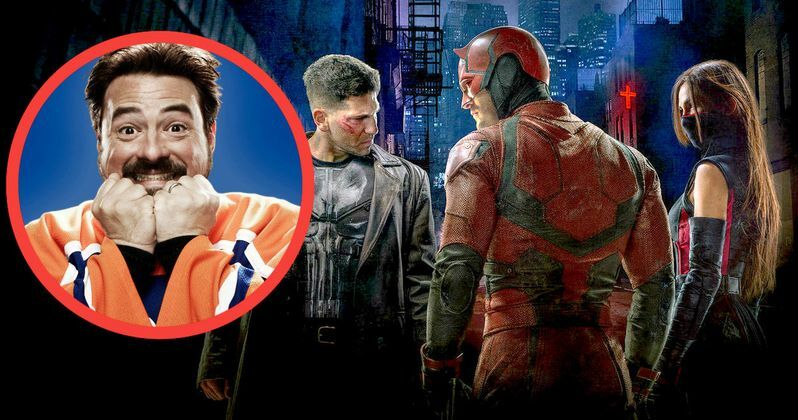 During an interview with IGN, director Kevin Smith revealed how he's been pitching Marvel chief creative office Joe Quesada, who he worked with on a run of Daredevil comic books, about directing an episode of Daredevil Season 3. Here's what the filmmaker had to say below. "I feel very at home in that Flash world, so much so that I'd love to do the others. I even told Joe Quesada - we worked on Daredevil together back in the day, I wrote it, he drew it - I said, 'Dude, I want to direct Daredevil, man. That'd be wild to be able to do it in real-life - let's co-direct it, that'd be cool, just like we did the book. We could co-direct an episode and then, like, take the passion from the page to the screen.' I'm going to try and make that Daredevil thing happen. Every time I talk to Quesada or [Executive Vice President of Marvel Television] Jeph Loeb, I'm like, 'Hey! When are you going back down to the cameras?'" Daredevil debuted last spring, with the second season premiering in March. The show is the first of four to debut on Netflix, followed by Jessica Jones, which premiered in November, Luke Cage, arriving this coming September, and Iron Fist, which doesn't have a premiere date yet. All four of these Marvel heroes will be teaming up in the miniseries The Defenders, which doesn't have an air date set at this time. Kevin Smith also revealed that he'd love to direct an episode of The Defenders as well. "You know, they're gearing up now for The Defenders. If I can get a piece of that Defenders mini-series holy s**t, could you imagine, dude? Because then you're working with multiple suits at once, that'd be phenomenal. Just doing a mini Avengers - even one episode of that run of Defenders is like, 'oh, I get to exercise any interest I had in Avengers but doing it on a scale where nobody's betting $200 million on the guy that made f**kin' Yoga Hosers.'" While the filmmaker's TV slate is certainly growing, he's best known for his work on the big screen with comedies such as Clerks and his new True North Trilogy, which started with last year's Tusk, continues with this year's Yoga Hosers and concludes with Moose Jaws. When asked if he'd ever consider making a Marvel adventure on the big screen, the director revealed that he doesn't think that would be right for him. Here's what he had to say below. "I don't know if a feature would be [for me]. In episodic, somebody did all the heavy lifting for you, told this backstory, and added to the characters and stuff, so you've got this rich tapestry to play with for an hour where you don't have to tell everybody and origin story, or tell everyone how this person feels about being this character. In movies, spectacle's what drives that engine, because that's what they're going to put in the trailer, that's what's going to make you leave your house to go see it. 'Holy s**t! Did you see that shot of a giant wave?' I'm not that guy. I'm the guy where they've got to sell it on, 'oh, did you see that scene where they were talking to each other?' That's generally not what people are looking for in a comic book movie." Last season, Daredevil introduced iconic comic book characters such as Punisher (Jon Bernthal) and Elektra (Elodie Yung), but we don't know which characters may debut in Season 3. Since Season 3 hasn't been officially announced yet, it isn't known when production may begin. We'll have to wait and see if Marvel will in fact bring on Kevin Smith to direct either Daredevil or The Defenders, so stay tuned.